Get the Chairside Instructor book and app together, save $50 off the individual prices! 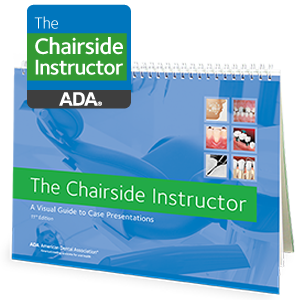 With over 250 full-color photos and illustrations (including 51 new/revised), the Chairside Instructor covers a wide range of prevention and treatment topics, including hygiene; anatomy; x-rays; perio; tooth restoration and replacement options; cosmetic treatment; TMD; pathologies; bruxism and more. Book has 58 laminated pages, 11” x 8.5”. Now offering over 250 full-color dental images and 25 animations, the ADA Chairside Instructor App is your all-in-one resource for visual patient education. New expanded content now includes these topics: Effects of sugar on oral health; steps of filling a cavity; tooth erosion; gum recession; peri-implantitis; and tobacco use. Available for Apple devices only, in English and Spanish. Order here on adacatalog.org, then complete your download on iTunes or the App Store. For additional details click on the orange Sample icon above.